Question:I will create the PDF from website content. I created the PDF by cropping the website screen. Then, I have gotten PDF of only part that is currently displayed on the screen of phone. I want to get PDF of all website contents. Does anyone know to solve this problem? Is there any solution on VeryPDF? Answer: According to your needs, maybe you need to save website content to local HTML file then create PDF from local HTML file. VeryPDF Free Online Document Viewer can help you create PDF from website content IOS but you need to save it to local file then you can make it. 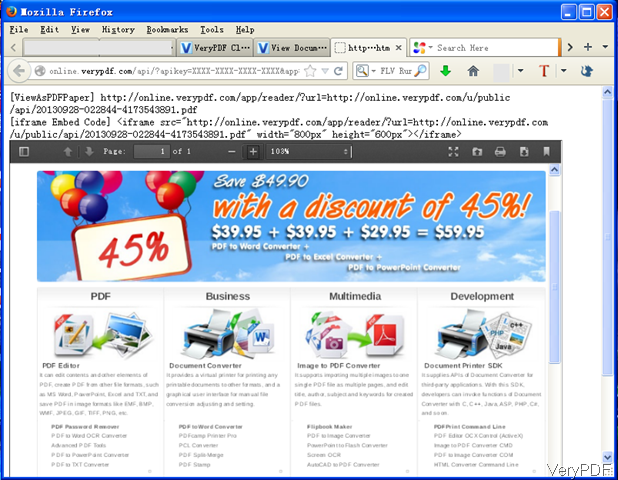 Or you can save the website content to local HTML file on computer then create PDF from those local HTML files. The created PDF with website content could be viewed at any IOS devices or applications. By this method you can avoid getting part of the content of website. And this online document viewer is totally free, so you do not need to worry that you will spend money on it. Please check more information of this software on homepage, in the following part, let us check how to use this software. This website either could be opened at IOS application but it can not convert online website to PDF directly. Please save it to local HTML file. The following snapshot is from the website, please have a check. Once you open it then you will know how to use it as all the steps have been marked quite clearly on website. After saving online website content to local HTML file, please upload it to this website by clicking button Browse. Then input the API code if you have. Please choose HTML 2 Paper Viewer enabling you to view created PDF on IOS without any problems. Then click button Upload and Converter, you will enter another tab, where you can get the URL of PDF created from website content. Step 2. Download created PDF from website content under IOS. When you enter another tab then you will see the following snapshot. There is a URL of the created PDF from website content. 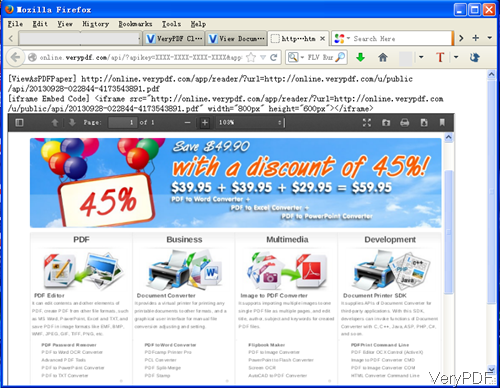 In the above snapshot, I will VeryPDF website for example. Please copy the URL above into a new tab and press enter then you can download the online PDF to local device. Meanwhile the created PDF is also shown below. By the iframe code, you can embed the created PDF to any website or blog. By this free online application, we can create PDF from website content under IOS. During the using, if you have any question, please contact us as soon as possible. How to convert files of extension with .doc, .xls, .ppt to PDF? Is there a utility to create a PDF file from many html files under Linux? How to create letterhead PDF file by PDF Editor? How to create PDF from various image formats? How to call Web Based or Cloud Based PDF Stamping Service from Java source code? How to convert PDF to image using PHP by API? How to share document from Android device to social network for example Twitter? Where to find PDF e-Book files on internet? This entry was posted in VeryPDF Cloud API and tagged create PDF. Bookmark the permalink.